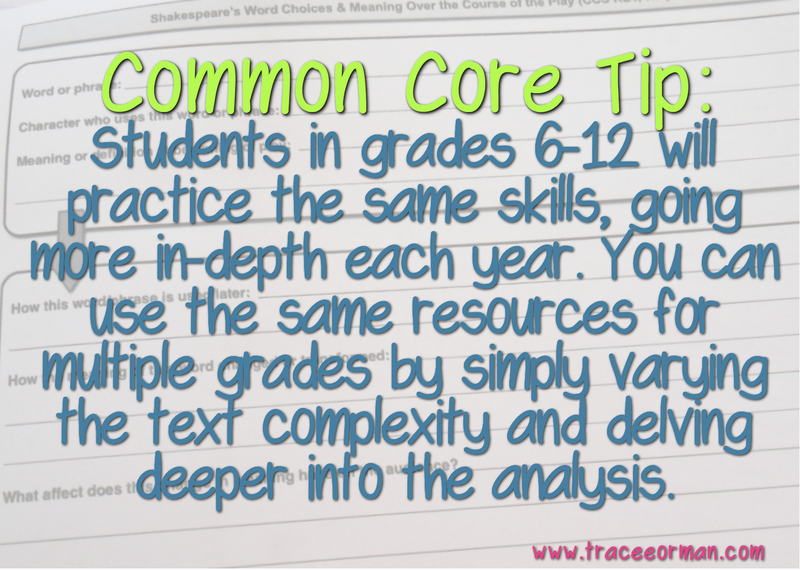 Align your lessons with the Common Core Standards. 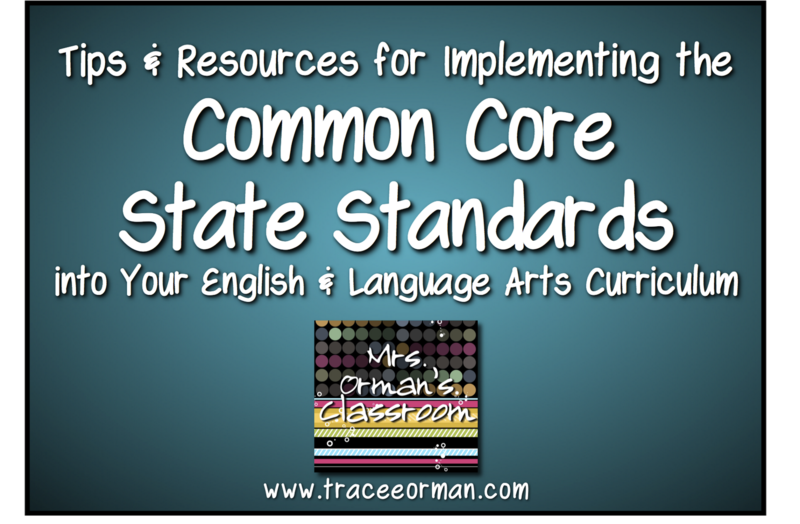 If you teach in one of the 48 states that has adopted the Common Core State Standards (CCSS), chances are you've been looking for resources to help ensure your students are practicing the essential skills to meet the standards. And chances are you haven't found much for grades 6-12. I'd like to offer some tips that I learned as I went through this process during the 2010-2011 school year. Check back often to read my next tip (I'll have several). See tip #1 here. RL.11-12.1. Cite strong and thorough textual evidence to support analysis of what the text says explicitly as well as inferences drawn from the text, including determining where the text leaves matters uncertain. At the sixth grade level, it seems as though just one supporting piece of evidence is necessary to find in the text, while seventh through 12th grades require more than one piece of evidence, and/or more difficult texts to find the supporting evidence from eighth grade on up. This is helpful because students will continue to build on these same skills each year, reinforcing what they know. It's also to your advantage when it comes to finding resources by using materials that cover several grade levels. My graphic organizers can be used with any text (fiction or non-fiction) in any content area. I begin with the anchor standards, then add directions or prompts that suit the grade level. Therefore, if you teach both an 8th grade and 11th grade literature class, you would only have to purchase the organizers for grades 11-12 because those will have all the materials from grades 6 on up. The organizers for grades 6, 7, and 8 are very similar to those for grades 9-10, so only one or the other would need to be purchased if you taught any of those grades. This is why my organizers for grades 11-12 are more expensive--they contain more and go more in-depth on many of the standards. • You can also find resources through Charity Preston's Common Core Reading Lessons website. Just click on the specific grade level you are looking for. The NGA Center for Best Practices (NGA Center) and the Council of Chief State School Officers (CCSSO) hereby grant a limited, non-exclusive, royalty-free license to copy, publish, distribute, and display the Common Core State Standards for purposes that support the Common Core State Standards Initiative. 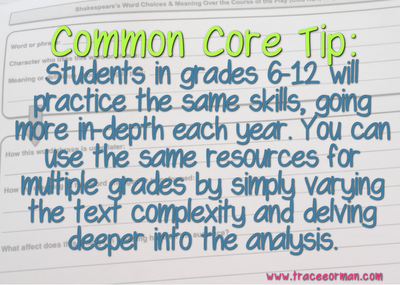 These uses may involve the Common Core State Standards as a whole or selected excerpts or portions. NGA Center/CCSSO are the sole owners and developers of the Common Core State Standards.